Aim: The aim of this study was to assess the cleaning capacity of the Protaper system using motor-driven or manual instrumentation. Materials and Methods: Ten mandibular molars were randomly separated into 2 groups (n = 5) according to the type of instrumentation performed, as follows: Group 1 - instrumentation with rotary nickel-titanium (Ni-Ti) files using ProTaper Universal System (Dentsply/Maillefer); and, Group 2 - instrumentation with Ni-Ti hand files using ProTaper Universal (Dentsply-Maillefer). Afterwards, the teeth were sectioned transversely and submitted to histotechnical processing to obtain histological sections for microscopic evaluation. The images were analyzed by the Corel Photo-Paint X5 program (Corel Corporation) using an integration grid superimposed on the image. Results: Statistical analysis (U-Mann-Whitney - P < 0.05) demonstrated that G1 presented higher cleaning capacity when compared to G2. Conclusions: The rotary technique presented better cleaning results in the apical third of the root canal system when compared to the manual technique. Keywords: Cleaning capacity; endodontics; manual instrumentation; rotatory instrumentation. ProTaper Manual instruments appeared as an alternative for rotary ProTaper. They have the same philosophy for use, indications and sequence; hwoever, are available at a lower cost as no electric motor is needed. The aim of this study was to compare the two endodontic instrumentation techniques, manual and rotary, with regard to their cleaning capacity of the apical third in mesial canals of human mandibular molars. Ten human mandibular molars were used in this experiment. The necessary approvals were obtained from the Research Ethics Committee of our institute before starting the study. Radiographs were taken of the teeth, and teeth with endodontically treated root canals, incomplete rhizogenesis, internal or external resorption or root fractures, were excluded from the study. Teeth with root canal angulations of 0° to 5°, and 10 mm in root length were used. The crowns of the teeth were sectioned close to the amelocemental junction with a double-faced diamond disk (KG Sorensen; Sγo Paulo, SP, Brazil) mounted on a high-speed handpiece (Silent - MRS 400; Dabi Atlante, Ribeirγo Preto, SP, Brazil). As soon as the mesial roots were separated, debridement of the root canals was performed. Afterwards, the teeth were randomly separated into two groups with five specimens each. Considering that each mesial root has two canals, ten samples for each group were used. Initial root canal exploration was performed by introducing a K-type file #10 (Dentsply/Maillefer; Tulsa, OK, United States of America) into the canal until it was seen in the apical foramen of each tooth, and then the file was withdrawn 1 mm, thus determining the real working length. The working length was respected during the entire instrumentation procedure. During debridement of both groups, 1 ml of 1% Sodium Hypochlorite (NaOCl) solution was used for irrigation at each change of instrument. Irrigation and aspiration were performed using the Ultradent irrigation - aspiration kit (Dentsply/Maillefer). In the roots of Group 1, initial debridement was performed with K file # 10 (21 mm - Dentsply/Maillefer, Tulsa, OK, United States of America), at the working length, previously obtained, with movements of catheterism, and followed by instrumentation with Ni-Ti rotary files of the ProTaper Universal system (Dentsply/Maillefer) using the endodontic motor X-Smart, according to the technique recommended by the manufacturer. These special files were used following the order: SX, S1, S2, F1 and F2. The root canals were debrided until each file reached the real working length, being immediately withdrawn. This procedure was performed twice. In Group 2, debridement was performed with K file #10 (21 mm - Dentsply/Maillefer, Tulsa, OK, USA) at the working length, followed by instrumentation with Ni-Ti ProTaper hand files (Dentsply/Maillefer) according to the technique recommended by the manufacturer in the following order: SX, S1, S2, F1 and F2. The root canals were debrided using the same method as the one for the root canals in Group 1. The rotary and hand files were replaced by new files after every five canals were debrided. After debridement, the roots were placed into distilled water at room temperature for 24 hours. Next, the teeth were submitted to routine histotechnical processing. First, the specimens were dehydrated by alcohol in the ascendant scale (70%, 90%, 95% and 100%). Then, they were immersed into xylol and paraffinization was performed to obtain the blocks and sections of the tissues that would be analyzed. The paraffin blocks were placed in a microtome and the cross sections were made of the apical third at 2 mm from the apical foramen. Three semi-serial sections measuring 5 μm each were placed on the same lamina and the process was repeated three times for each tooth, totaling 90 sections on 30 laminae, which were then stained with hematoxylin and eosin. Histological analysis was carried out blindly by a single examiner under an optical light microscope (Axio Star Plus; Carl Zeiss, Oberkachen, Germany) at 120X magnification. The images referring to these sections were analyzed using the Corel Photo-Paint X5 program (Corel Corporation; Sγo Paulo, SP, Brazil). An integration grid with 300 (20 x 15) points, generated by the program, was superimposed onto each image obtained. The total area and percentage area occupied by the debris was then calculated. The total area of squares present in the canal lumen as well as the squares that coincided with the canal wall and lumen were considered. The results of all measurements were submitted to the U-Mann-Whitney statistical test, at a 5% level of significance, using the software Graphpad Prism 4.0 (GraphPad Software, La Jolla, CA, EUA). The mean values in percentage for the cleaning capacity using different techniques may be seen in [Figure 1]. 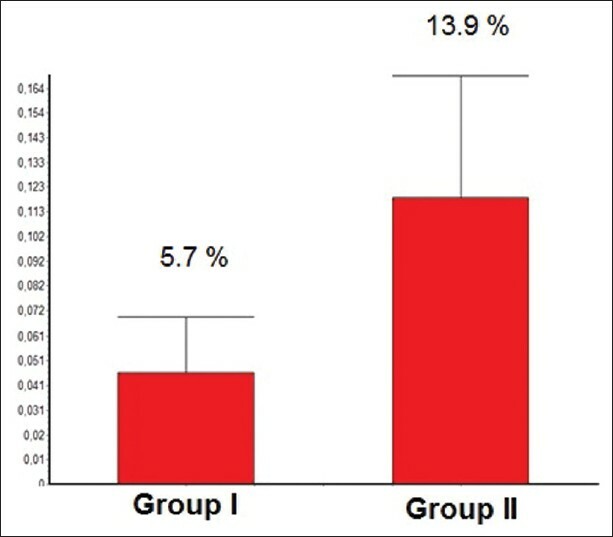 The analysis of the results demonstrated that Group 1 presented higher cleaning capacity of root canals in the apical third [Figure 2] with a statistically significant difference, when compared to Group 2 (P < 0.05). To reduce the amount of the remaining debris, Baratto-Filho et al. conducted a study with rotary instrumentation using Ni-Ti files; however, used different irrigation solutions. Thus, the study showed that 2.5% NaOCl solution is more effective to clean root canals than at other concentrations (1% and 0.5% NaOCl). Whereas Passarinho-Neto et al.,  also used a rotary instrumentation system with 1% sodium hypochlorite as the irrigation solution, but in combination with ultrasound in the apical third of flattened canals, and showed that it was more effective to remove debris when compared with irrigation without using the ultrasound. The present study used 0.8% physiological solution as the irrigation solution without modifying the solution components or concentrations of the irrigation solution used. Therefore, it may be concluded that the rotary technique showed better cleaning results in the apical third of the root canal systems; however, further studies using other irrigation solutions and instrumentation techniques are needed to standardize the results. 1. Grecca FS, Garcia RB, Bramante CM, Bernardetti N. A quantitative analysis of rotary, ultrasonic and manual techniques to treat proximally flattened root canals. J Appl Oral Sci 2007;15:89-93. 2. Siqueira JF, Araujo MC, Garcia PF, Fraga RC, Dantas CJ. Histological evaluation of the effectiveness of five instrumentation techniques for cleaning the apical third of root canals. J Endod 1997;23:499-502. 3. Rasquin LC, Carvalho FB, Lima RKP. In vitro evaluation of root canal preparation using oscillatory and rotary systems in flattened root canals. J Appl Oral Sci 2007;15:65-9. 4. Sicher H, Tandler J. Root canal anatomy. Dent Clin North Am 1979;23:555-73. 5. Marchesan MA, Arruda MP, Silva-Sousa YT, Saquy PC, Pecora JD, Sousa-Neto MD. Morphometrical analysis of cleaning capacity using nickel-titanium rotary instrumentation associated with irrigating solutions in mesiodistal flattened root canals. J Appl Oral Sci 2003;11:55-599. 6. Elayouti A, Chu AL, Kimionis I, Klein C, Weiger R, Löst C. Efficacy of rotary instruments with greater taper in preparing oval root canals. Int Endod J 2008;41:1088-92. 7. Gonçalves LC, Sponchiado-Junior CE, Marques AA, Frota MF, Garcia LdaF. Morphometrical analysis of cleaning capacity of a hybrid instrumentation in mesial flattened root canals. Aust Endod J 2010;36:1-6. 8. Barbizam JV, Fariniuk LF, Marchesan MA, Pecora JD, Sousa-Neto MD. Effectiveness of manual and rotator y instrumentation techniques for cleaning flattened root canals. J Endod 2002;28:365-6. 9. Sasaki EW, Versiani MA, Perez DE, Sousa-Neto MD, Silva-Sousa YT, Silva RG. Ex vivo analysis of the debris remaining in flattened root canals of vital and nonvital teeth after biomechanical preparation with Ni-Ti rotary instruments. Braz Dent J 2006;17:233-6. 10. Baratto-Filho F, Carvalho JR Jr, Fariniuk LF, Sousa-Neto MD, Pecora JD, Cruz-Filho AM. Morphometric analysis of the effectiveness of different concentrations of sodium hypochlorite associated with rotary instrumentation for root canal cleaning. Braz Dent J 2004;15:36-40. 11. Passarinho-Neto JG, Marchesan MA, Ferreira RB, Silva RG, Silva-Sousa YT, Sousa-Neto MD. In vitro evaluation of endodontic debris removal as obtained by rotary instrumentation coupled with ultrasonic irrigation. Aust Endod J 2006;32:123-8. 12. Glossen CR, Haller RH, Dove SB, Del Rio CE. A comparison of root canal preparations using Ni-Ti hand, Ni-Ti engine driven, and K-flex endodontic instruments. J Endod 1995;21:146-51. 13. Esposito PT, Cunningham CJ. A comparison of canal preparation with nickel-titanium and stainless steel instruments. J Endod 1995;21:173-6.
dhaded, n. and uppin, v. and dhaded, s. and patil, c.